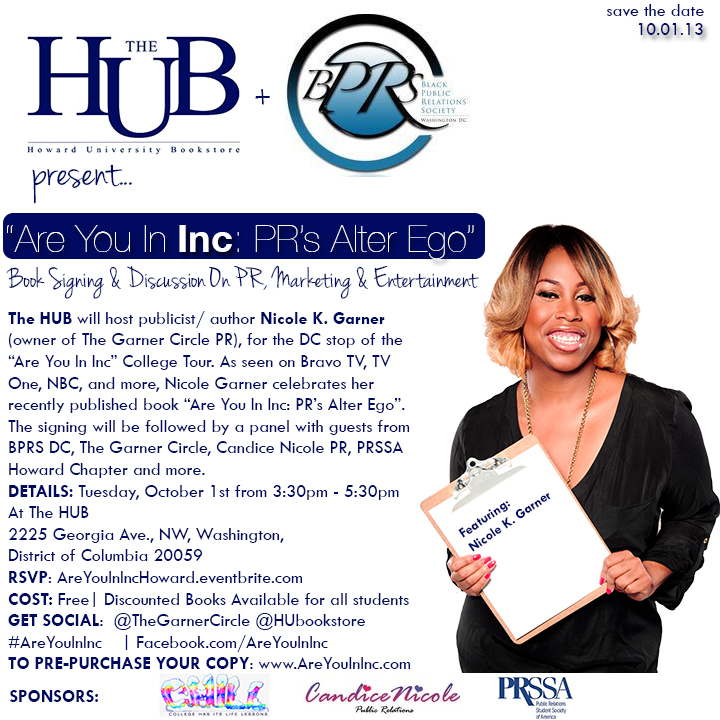 I would first like to share that I am honored to be a sponsor of the DC stop for the "Are You In Inc: PR's Alter Ego" book tour! Publicist/Author Nicole Garner (based in Atlanta) has been a woman I have been watching from a far and I knew one day we would work together so this is very exciting! The panel will occur after the book signing Oct 1st! More information and RSVP link is below. 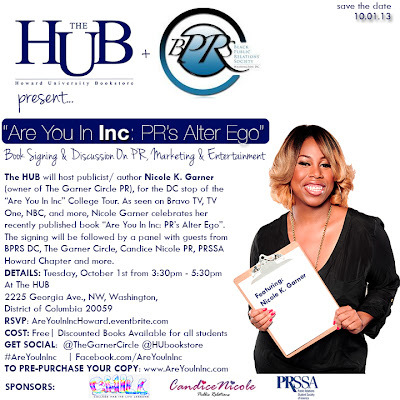 Washington, D.C. (October 2013) - Author Nicole K. Garner, founder of The Garner Circle PR, pens "Are You In Inc: PR's Alter Ego". This ultimate guide focuses on niche Public Relations and publicity disciplines of fashion, music, entertainment and film. This complete manual is filled with everything one needs to know about the fabulous world of PR equipped with very specific tools of the trade. To celebrate the book, Amazon Publishing has joined forces with Garner to create a multi-market tour collegiate tour. The Howard University Bookstore (HUB) will host the DC stop on the tour on Tuesday, October 1, 2013, on the campus of Howard University. "This is the book I wanted when I was twenty- two years old and jumping into the world of publicity, wide - eyed and unaware of what was ahead. After many years of first- hand experiences, ground breaking campaigns, and my fair share of horror stories, looking back I realized that process did not have to be so long and tedious. I then vowed that someday I would gather everything that I learned along the way, compile my findings in a book and share with those who have this unexplainable adoration for the profession of publicity" states Nicole Garner- Author of "Are You In? Inc." & founder of The Garner Circle PR. The book includes [IN]terviews from: BET.com's beauty editor, award winning artist Janelle Monae, Daily Candy, Sony Productions Unit Publicist, The Garner Circle PR, top bloggers & more. "Are You In Inc: PR's Alter Ego"
contains tricks of the trade regarding how to achieve millions of mediaimpressions and generate large scale publicity campaigns, tips for seamlessly merging technology into PR strategy, and how to get in the ink of major magazines and blogs.